I’m watching a special 4-hr. program about this right now on the History Channel. God Bless them All….special special people! Pedro, I think Tolkien would take issue with that idea. He depicts war as the the most anti-nature thing humans can do. The toxic slag heaps in front of the Black Gate of Mordor are his dark nod to the desolation he saw during the Great War. At very least, WW2 reveals that Mother Nature outdid herself with the nuclear threat that was birthed from it. Yet I think he would sadly agree that we never learn from past mistakes. Maybe man’s base nature is to be violent, It takes a massive amount of effort to oppose such tendencies. There’s to many white crosses and tomb stones to attest to this. Our family had 4 brothers fighting with the Army as Infantry “Grunts” during WW2. Just like in the Movie “Saving Private Ryan”, but not quite……………. They were all in the ETO. Sadly 2 were killed (or died of their injuries) within 108 days. The other two brothers were seriously wounded. The first named John B Gardner jumped into Normandy with the 101st, inland of Utah Beach. One brother named Calvin had served in North Africa, then Italy and finally France. He and his brother Theodore ( supposedly as part of Patton’s 3rd Army) landed at Utah on D Day + 58 (August 3rd). Calvin was killed in the Moselle Forrest , near San Juan France on September 25th, 1944. He was the mortar man. Theodore was killed on Christmas Eve somewhere near Bastogne and was headed towards Bastogne when he was killed. Ironically his brother John was in Bastogne as part of the 101st. Another brother named Ward, was wounded in both shoulders by a sniper near Strasbourg France on December 15th. He laid still and crawled away when it became dark. As he was crawling under darkness, incoming mortar fire wounded him again in his leg. He was evacuated to England and survived the War. Then John (serving with the 101st) was wounded in Belgium closer to the end of the War on January 15th…………. He also survived the War. This is a copy of the letter the parents received……………. I have recently learned that you are the parents of four sons whose services have been given to the armed forces. Ward F. Gardner, Jr., Theodore O. Gardner, John B. Gardner and Calvin R. Gardner are all on the rolls of the Army. Two you your sons have sacrificed their lives in the service of their country. In extending my deep sympathy to you for this loss. I should like to express my gratitude for the service of these fine young men. I am acutely aware of the anxieties which war requires of parents, even when Providence returns their sons unharmed. In your case, the sacrifice is heavy to bear, since it has taken two of your sons from you. In spite of your sorrow, I know that you must feel a great since of pride in the contribution to victory which your sons have made in the late ruthless war. You may be sure that the nation shares this feeling with all parents whose courageous boys drove forward with our forces to crush the military power of our enemies and to bring us peace at last. I sincerely thank you David, for posting this. Louis, that’s incredible. What, precisely, was the relationship between these men and your father? I was told many years ago that my Dad shared the same Great Grandfather. I know that there’s a family connection somewhere back then. My sister is really into genealogy and she will probably know right away. I’ll ask her to confirm this, and let you know what I found out. David every June 6, I would call my father and ask him what he was doing on that date in 1944. Answer was always the same “Hell yes I do.” Later in life he related that he was never so scared in all his life especially when the AA fire came up. Said the tracers were so thick it appeared you could walk on it. Being a stick commander, when the left engine on his A/C caught fire, he said”Boys were leaving” and out the door they went. RIP, Sgt Paul Bebout, 1st Bn, 501st PIR, 101st Airborne Division. Many gave up their tomorrows so we could our yesterdays. God bliss them all. Amazing, Tom. Truly, they walked among us as we did our daily routines, but those routines would have been impossible without them. David, my childhood barber, a man named Ed Miller, stormed Omaha Beach. He told my father that among all the chaos, he saw a cleft in the rock and told himself that if he could make it there he might survive the day. In 2015, I had the honor of standing on those beaches and trying to imagine what those men went through. Thanks for posting the reminder. 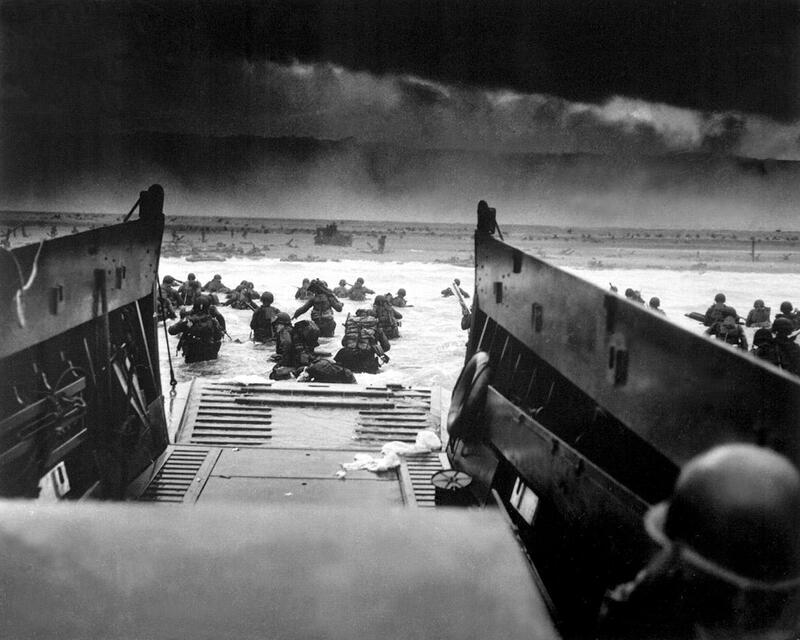 The top photo was entitled “Into the Jaws of Death” and is one of the most reproduced photos from D-Day, June 6, 1944. The photo was taken by US Coast Guard Photograph’s Mate Robert F. Sargent. Chief Sargent was a veteran of the invasions of Sicily and Salerno and volunteered to be among the first landing craft to bring troops to the beach. He took the photo from the LCVP at Sector “EASY RED” of Omaha Beach at 07:30 local time. The boat’s coxswain was USCG Bosun William Harville of Petersberg, VA., his boat engineer was USCG Seaman First Class Anthony Helwich of Pittsberg, PA., and the bow ramp operator was USCG Seaman First Class Pat Papandred of Detroit MI (his helmeted head is visible in the right foreground). The landing craft made 6 round trips to the beach head that day operating from the CG transport SAMUEL CHASE, part of the task group 124.3. David, this is very interesting. Louis & Tom; special blessings for your relatives. God Bless ALL who did their duty and lived or those who did their duty but sacrificed themselves for the gallant cause. And … blessings to those men on the other side who gave their lives for THEIR country’s sake.